I guess she’s a “longtime LGBT ally” if the “L” is a typographical error, the “B” is silent, and the “T” was added by a politically correct editor. This is just more proof that “mainstream” blogs get it wrong some of the time. When fellow comedian and long-time anti-LGBT celebrity Tracy Morgan apologized for his anti-gay jokes, Rivers said he shouldn’t have bothered, since gay people shouldn’t be watching him anyways. And when fellow 30 Rock star Alec Baldwin made an anti-gay slur, Rivers again jumped to the defense with her own anti-gay comments. I’m not trying to be mean-spirited and wish her or her family pain in her illness, but for goodness sake, let’s be honest here – she is not an ally of transpeople and her record is spotty at best for the LGB community. The author of this article has just grabbed “LGBT” and thrown it out there without any real thought or meaning. 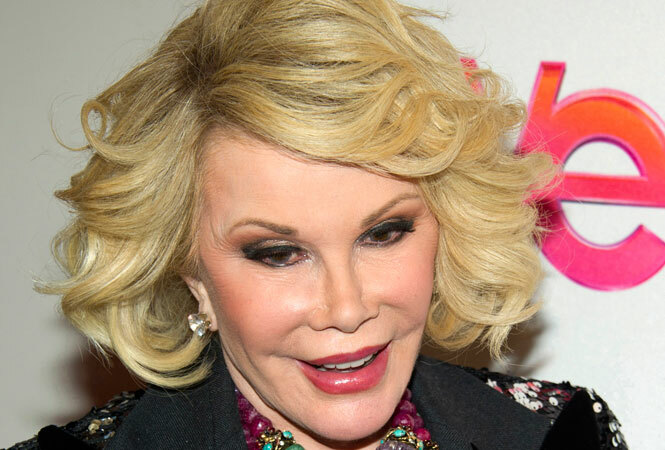 Daughter: Longtime LGBT ally Joan Rivers is in ‘serious condition’ – LGBTQ Nation. This entry was posted in Activism, Entertainment and tagged celebrities, hollywood, transphobia on August 30, 2014 by .